When we perform the “Tenzan Lenko” Chi Kung routine we stretch the fingers and all the joints of the body. While we stretch we also focus on the name of the fingers; the 4th finger from the inner side (anular finger) is called “kusuri youbi”, the “medicine finger”, by the Japanese. The name seems to originate in Yakushi Nyorai (the Buddha of healing and medicine in Mahayana Buddism) using the fourth finger when melting the medicine in water, long time ago. My dear friend Hideno Yagi passed me this information a while ago, as soon as I heard this interesting way to refer to the anular finger. 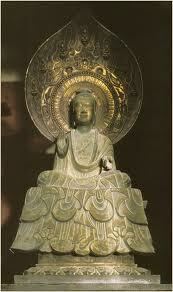 She also passed me a nice picture of Yakushi Nyorai that you can see in Buddhist temples in Kyoto, Nara and Kinki area, besides Kanno and Amitabha.